While I have spent time teaching everything from fifth grade physical science to high school earth science, environmental science has always been where my heart is. I actually never even liked science until I took Intro to Environmental Science in college! Becoming a science teacher was definitely at the bottom of my career choices prior to that course! Anyway, environmental science is essentially an interdisciplinary field that looks at how humans and human systems fit into the “natural” world (granted, we are a part of that natural world). While there’s all kinds of theories on different lenses through which to study environmental science, I’m not going to get into that here. I just want to say – I love environmental science, and so anytime I have the opportunity to incorporate some type of environmental theme into a unit, I do! In Earth Science, I build my atmospheric science unit around the issue of global warming and climate change, and I use a water resources unit to discuss water quality issues and pollution. Ecology is another disciplinary area where it is SO EASY to incorporate environmental issues. I actually frame my entire ecology unit around the issue of invasive species. Believe it or not, you can meet every single one of the performance expectations in the middle school Ecosystems: Interactions, Energy, and Dynamics DCI by studying invasive species. While I can’t wait to share more with you about that in a future post (it’s coming soon, I promise! ), today I just want to share one of my favorite activities in honor of April’s status as National Frog Month – an Ecology Mystery: Where Have All The Tree Frogs Gone? Register for this FREE 5 Day Training to jumpstart your NGSS transformation! We'll cover content, instruction, assessments, and so much more! Yes! Save Me A Seat! After working through our ecology unit, and one students have a firm grasp on the many factors that can play a role in maintaining stability or causing change in ecosystems, my students will participate in this detective-style activity designed to solve an ecology mystery — a sudden decline in the tree frog population in a fictional Florida town. 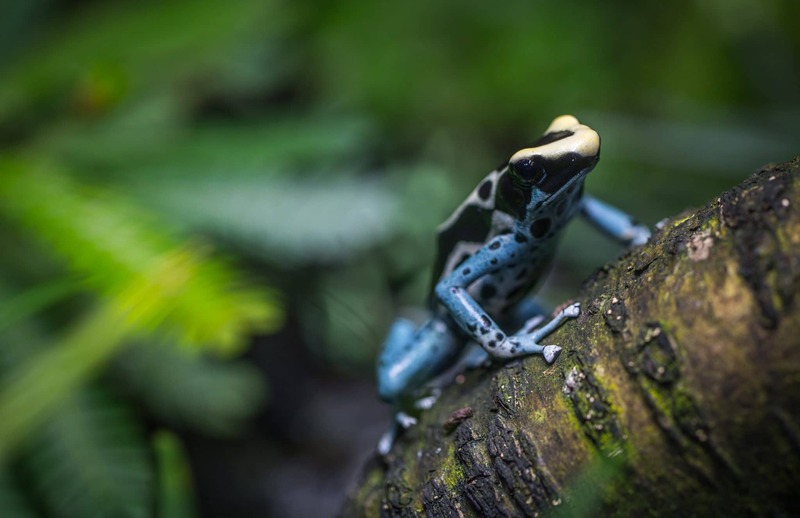 That said, a decline in amphibian populations is NOT a fictional issue, as year after year scientists are seeing population levels plummet in response to a host of issues — from climate change to water pollution to habitat destruction. Anyway, in this activity, students are provided with a stack of fictitious clues to explore — from advertisements from the local garden shop, company memos about the success of a recent sale, and diary entries, to newspaper articles and graphs of data collected by local scientists. They have to use these clues to answer the question, What happened to the tree frogs in Mayberry? For this activity, there is not a right or wrong answer — a “right” answer is one they can support with evidence and reasoning. After working together to examine the clues, students use a graphic organizer to propose three plausible causes of the population decline, and then they write a Claim-Evidence-Reasoning argumentative response based on the theory they believe is best supported by the evidence. If you’re interested in creating your own detective-style activity like this, you can follow the same steps I did below! For my ecology unit, using a change in population was a no-brainer. I chose frogs because amphibian populations are actually declining in the real world, and I was able to find a ton of resources about that issue to help me build my clues. That said, you could choose any number of animals to focus on — a fish population in a stream or the ocean, a population or community of macro-invertebrates, honey bees, or something larger like bald eagles. The most important thing is to find a problem that could have several potential causes. This could be done with other disciplinary areas as well. For example, in an earth science class where students are learning about water resources, you could investigate water contamination. What caused the contamination — mining? A hazardous waste site? Non point source pollution from nearby farms or fields? Factory dumping? Was the water contaminated as it traveled through the pipes? Was it a combination of factors? In a health science class, students could track the source of an epidemic, using clues about when symptoms started and where people traveled to work their way to patient zero and the disease’s source. Whatever topic you choose, it is important that there is some ambiguity in terms of the correct answer. Students need to be able to argue their point – finding the evidence to support it – while still reasonably considering other options. So you’ve picked a topic with several possible solutions — now, list those out. You’ll want to provide at least one – potentially two or three – clues for each solution. Before you can construct the clues, you need to know what you’re “clueing” people into. So write out those solutions! Beneath each solution, start brainstorming clues. For example, if we were looking at water contamination, I might include a brochure for historic mine tours, as well as a memo from the EPA (or a fictitious agency) about the dangers of acid mine drainage. I could include a map of hazardous waste sites which indicates a site near the source of water (stream, lake, whatever). I could include a company email about factory dumping, as well as a diary entry from a young person who witnessed some sort of dumping event. I may include research on how certain characteristics of water can degrade lead pipes and a note from a plumber about disposing of lead pipes he replaced at an old home. Lastly, I could provide graphs about land usage in the area, indicating a significant amount of farmland and fields, and a newspaper article with an interview of a farmer who discusses the challenges of farming and his use of pesticides, herbicides, and fertilizers. These are some examples of clues that students can use to build a case. You could also include some actual news articles and research papers to provide supplemental information that could help students – information about the consequences of commercial farming, the difference between point source and nonpoint source pollution, or how hazardous waste is disposed of. To maximize the “engagement” factor, make your clues look authentic. Use notebook paper for the diary entries (or invest in some notebook paper clip art and handwritten fonts) and bright colors for the advertisements. Format the memos and emails as they would appear in real life. Make the students believe they are truly science detectives! For this activity to be successful, students must have been introduced to these concepts before beginning. They need to have an understanding of the content in order to recognize the clues for what they are and piece together their argument. So make sure you cover the topics you are discussing — acid mine drainage, hazardous waste, agriculture, lead pollution, and so on. While exploring the clues is the fun part, to get some value from this activity, you will want to create some sort of assessment. To understand my students’ thinking, I asked them to identify three possible solutions and list the pieces of evidence that supported that solution. This showed me that they understood several different concepts that we had learned throughout the unit. To assess their ability to use that evidence to construct an argument, I had my students write a Claim-Evidence-Reasoning written response in which they identified the solution they thought best fit the evidence and then used the evidence to support it. This is an exercise not only in the content itself but also in important science skills and content literacy. You could also have students present their arguments or discuss them in a “Socratic Smackdown” type activity. If you haven’t heard of it, it is an amazing activity to generate TRUE discussion and engage students in the content and issues they are learning about. I’ll have to tell you more about that another time. Anyway, there you go! You have an awesome and engaging activity to wrap up your unit, and if your students are anything like mine, they will love it! They might not even mind writing the essay at the end. I respect your work, thankyou for all the great content. What do NGSS classrooms REALLY look like!? Jumpstart your NGSS transformation with this 5 Day Mini Course!